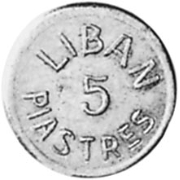 Along with the 1/2 Piastre, 1 Piastre, and 2 1/2 Piastres coins issued by Lebanon during World War II, there exists a 5 Piastre denomination. Very little is known about it and no public sales known from recent years. The coin is listed in Gadoury’s Monnaies et Jetons des Colonies Françaises, Schoen’s Welt Muenzkatalog, and the Standard Catalog of World Coins, among other publications. In Gadoury’s book, it just says “very few” for quantity minted, while Schoen states “1 ex. known”. All catalogs refrain from stating a value due to the lack of available information. This coin series has no date, but was minted 1941-1945. Also reported are a 1 Piastre coin struck in aluminum, and a 2 1/2 Piastres struck in aluminum-bronze. No other information is known at this time and anyone with further details is encouraged to share them with us. One of the many mysterious corners of Arab numismatics is the banknotes of Hejaz and circumstances surrounding their production. These unissued notes were only “discovered” in the early 1950s after the sale of King Farouk of Egypt’s collections. Few sets reportedly survive today and most collectors don’t even seriously consider trying to locate a set that is available for sale. I strongly recommend those interested to read this article. Without a doubt, the unissued Iraqi 100 Fils 1955 is one of the rarest coins in the Iraqi series. An unissued coin, with very few that actually escaped into the collector market (reportedly 1,000,000 pieces were mint but some experts “guesstimate” about 40 pieces to be in private hands today). The coin, even though dated 1955, carries the same characteristics as its 1953 counterpart. Contrastingly, the 20 and 50 Fils coins of 1955 are entirely different and carry a new design featuring two palm branches under the denomination. All three varieties are illustrated below. Another lesser known coin is the 5 Dinars of the “Emirate of Kuwait” dated 1961, of which reportedly 1,000 pieces were struck in 0.916 gold. Not very much is known about it, and no recent (if any) public sales records involving such a piece. It was probably never issued, and it is speculated that most of the mintage has been melted while a mere handful of specimens made it to private hands. In the “Guidebook and Catalogue of British Commonwealth Coins (3rd. Edition1, 1971), they report the coin’s “values” at £60 for an XF, £65 in UNC, and £80 in BU, which is odd considering the unavailability of public sales records. Any further information would be appreciated. These coins are amongst the few examples of unissued coins in the Arab world that were nevertheless widely forged. The story behind this odd pair is interesting, yet incomplete. The Iraqi government was making an attempt to locally produce coins, after having minted their previous issues abroad (mainly by the British Royal Mint). 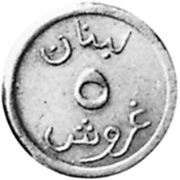 Around the late 1980s or early in 1990, a decision was made to locally produce two high denomination circulating coins of 5 and 10 Dinars. The coins which were reportedly struck by the Iraqi company that produced military decorations and medals. The designs used are unlike previously issued types, and the overall quality is rather crude, especially when compared to previously issued coins. An unknown but small quantity of these coins made its way to the market. Both denominations are difficult to find, and some convincing forgeries exist. More information on these coins can be found on this page, which is part of my friend Waad’s informative and well-illustrated web site on Iraqi numismatics.